If you want to learn more about bike repair, we’re happy to teach you while you refurbish bikes for us to use in our various donation programs, or to sell. We’re happy to introduce to the various skills needed while you fix bikes for us. And if you’re working on our bikes, yours is still ride-ready when you’re ready to go home. Volunteers are needed throughout the year, and for various special programs as well. So come see us and we can talk about your interests and how they match our needs. In addition to the camps, clubs and clinics, individuals are welcome to come to the shop and use a bike stand whenever a stand is available. Our senior technicians will work with you to teach you how to do your own repairs, and help you understand what you’re doing and why. If possible we appreciate a contribution of $5.00 per hour for stand time, and you’ll need to pay for any parts you use to do the repairs. We have all tools necessary for basic bike repair, and most of those needed for advanced repair as well. Stop by the shop to get a tour of the work stations and what’s available. 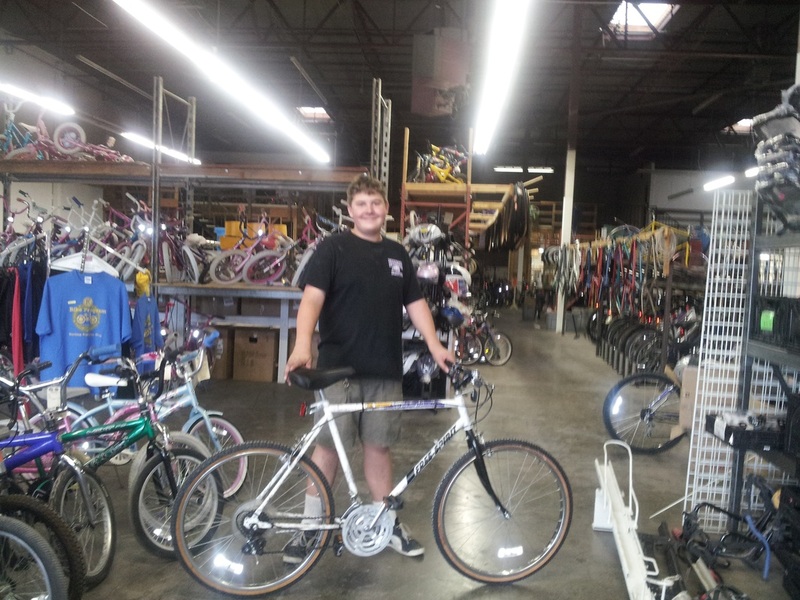 Kiwanis Bikes offers the opportunity to earn a bike at the shop. In return for a few hours of your time, you could come home with a refurbished bike! One you may have even refurbished yourself! Pick up an application at the shop or talk to a representative for more information. We have a limited number of Earn a Bike opportunities each month. If you’re in need of a commuter bike (inexpensive mountain bike), you can sign up to “pay” for a bike by volunteering 12 hours in our shop working for our repair needs, and then you can identify a bike to fix up for yourself. We supply used parts for the bike, and you do the work with supervision of one of our senior techs.